The grader operator is generally the most experienced and skilled operator on the jobsite. And very often the grader operator also has the grayest hair. The unique features on Komatsu graders do three things; First, they make the good operator better with precise, excavator style hydraulics and no worries about ever causing the engine to stall; Second, the unique dual mode transmission makes it much easier for inexperienced operators to improve their technique and get good quickly; Lastly, the hydraulics integrate extremely well with the latest grade control system for precision operation. With the longest wheel base in its class, the new GD655-6 offers exceptional fine grading performance. Even with a long wheelbase, the GD655-6 maintains a tight minimum turning radius, thanks to a maximum articulation angle of 25 degrees. This grader is extremely maneuverable and productive in tight road work or cul-de-sac applications. Thanks to the new, Komatsu designed, Tier 4 Final power plant, GD655-6 owners should see a drop in fuel consumption of up to 5% when operating in “power” mode, and up to 15% in “economy” mode, compared to the GD655-5. Komatsu’s Dual-mode transmission sets this grader apart from its competition. 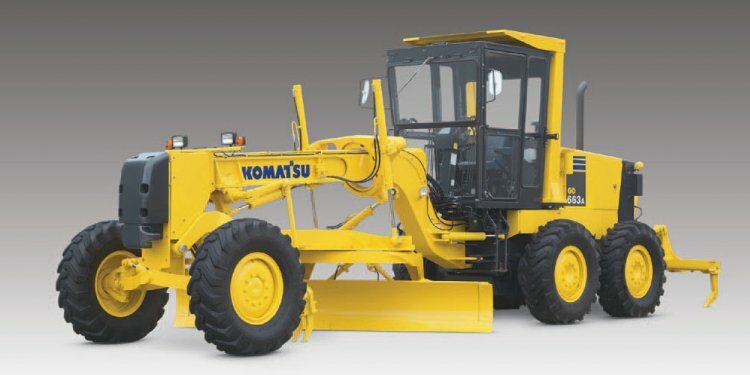 The Dual-mode transmission has been specifically designed for use in Komatsu motor graders. It allows operators to benefit from the low-fuel consumption and high ground speeds of a direct-drive transmission, as well as the high tractive effort, superior control at low speed, and anti-stall features of a torque converter transmission.